Hi friends! I hope those of you in the US are enjoying the long holiday weekend. Actually, I hope you are all enjoying a nice weekend! 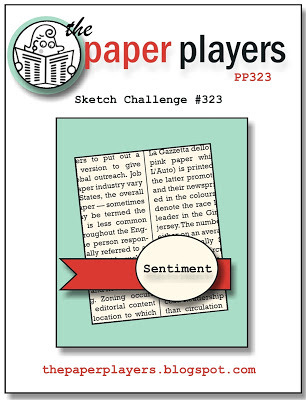 This week at The Paper Players it is my turn to be hostess, and I have a sketch for you to play along with. I love what the Design Team did with this one, and it's always so much fun to see all the different interpretations. I'm still working on Christmas cards and I hope you are not tiring of them yet. I also had a few new products from Hero Arts that I was eager to try out. I used three different stamp sets here, one for the background, one for the focal image and one for the sentiment. The script in the background was heat embossed with clear embossing powder. The focal image was stamped once, masked, stamp again and then colored with Copics. 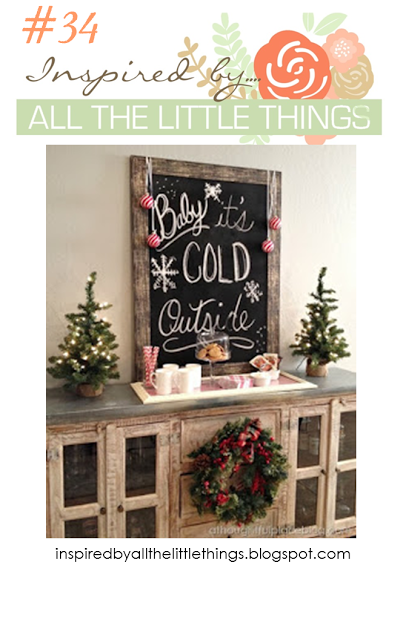 I am also playing along with the challenge at Inspired by All The Little Things. I was inspired by the Christmas theme, greenery and the colors. I'm so glad you stopped by today! Please take a moment to leave a comment, then head over to The Paper Players to see what the rest of our team has created. I hope you'll play along with my challenge this week, too! Gorgeous card and really love this holly stamp as the focal point! Thanks for joining us at Inspired By...All the Little Things! I love everything about this...the coloring, the scripty background, the holly! What a fabulous sketch! Gorgeous card, Sandy! I love how the kraft and black set off the holly sprigs. Which are beautifully stamped and colored. Love the elegant feel that the script background gives to the whole look. Gorgeous card for a great sketch! Beautiful card. I never thought to heat emboss a background stamp. I LOVE it. I also liked the black base when I first saw the card. The rest really stands out. So festive Sandy!I love the background on the crumb cake. The holly is so pretty too. Have a great week!! Love the beautiful holly....classy Christmas! Love the background! This is one of my favorite Christmas cards I have come across this year! Super job Sandy! This is beautiful! Wonderful take on the inspiration photo and on the sketch! Pretty, pretty, pretty. Love the scripty background for your holly branch. Loved your sketch this week too. I didn't think I needed to look for another pretty holly set, but Sandie you've convinced me I might!! OH so stunning! Sandy your holly is so perfectly coloured, love the background script! Thank you so much for sharing with us at All the Little Things this week! Love the holly as the centrepiece for your fab card Sandy and coloured beautifully, as always. Love the embossed script background too. A great card for a great sketch! Beautiful card! Love the holly. Thanks so much for playing along with us at Inspired By All The Little Things! So pretty! This is a really great take on the inspiration photo. Thanks for playing along with us at Inspired by All the Little Things.